Each morning of an IceBridge campaign members of the team go through the process of putting on warm layers to handle the cold weather. And while cold affects people extreme cold poses a challenge to IceBridge’s equipment ranging from camera batteries to the P-3 itself. It’s morning in Kangerlussuaq, Greenland, and time to get ready for another day of data collection. After grabbing a quick breakfast the team starts preparing to head to the airport, putting on warm layers to combat the cold weather. In April the temperatures in Kangerlussuaq can vary from highs around 40 Fahrenheit down to below zero, so it’s important to dress accordingly. The exceptionally cold mornings, those in the single digits and below, pose even more of a challenge to the team than what to wear. The cold not only affects people, it affects the cars and trucks the team use to get to the airfield and even the aircraft itself. Anyone who has had to start the car on a cold winter morning would agree that cold weather is tough on cars. And although that is the case, extreme cold makes operating an aircraft challenging. Unlike Thule there is no hangar for the P-3 to sit in overnight, leaving it exposed to the cold. This calls for extra steps to prep the plane in the mornings. Well before takeoff, the P-3 crew head out to the airfield to get things started. The first step is connecting hoses from portable heaters known as huffers to openings on special insulated covers on the engines. These insulated covers go on immediately after the P-3 returns from a flight, and while they don’t keep the engines warm overnight, they do trap heated air and allow the engine to warm faster. Other heaters supply warm air to the P-3’s cabin to start warming the computer equipment inside. Once this is started the crew will turn on the P-3’s auxiliary power unit, or APU, which provides heat and electrical power for the plane. However when it gets really cold, say -15 Fahrenheit like it was on the morning of Apr. 8, the APU itself also needs to be heated to make sure the oil in the APU is warm enough to start. With the APU running the P-3 has enough power and heat to allow researchers to begin warming up their instruments and computers. After a while the engines warm up enough for the flight crew to remove the insulating covers and then it’s time to fuel up and start the engines, which the pilots run for a while to make sure everything is right before taking off. Cold mornings make the already complex task of operating a flying laboratory even more challenging. This means that pre-flight preparations take a bit longer, but thanks to the hard work of aircraft crew, airport support personnel and instrument operators, the process runs as smoothly as possible. 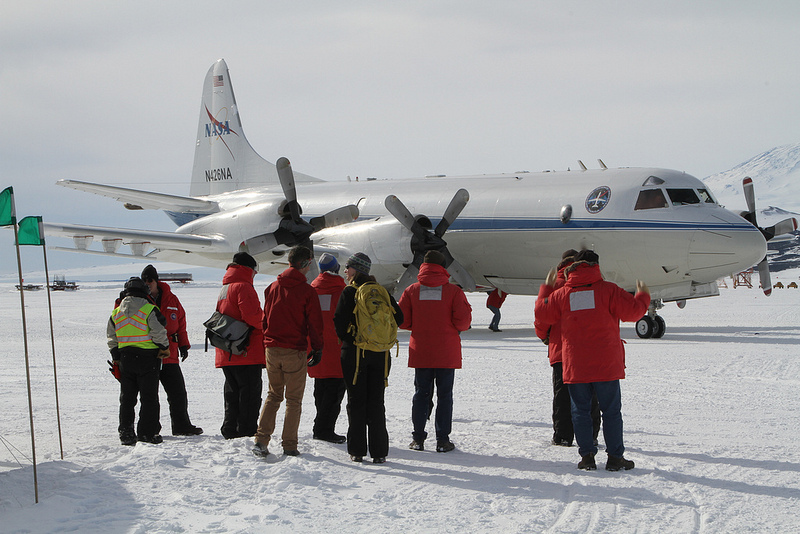 IceBridge uses a variety of instruments to measure polar ice, but the equipment mounted to the P-3 is only part of what’s needed for a successful campaign. 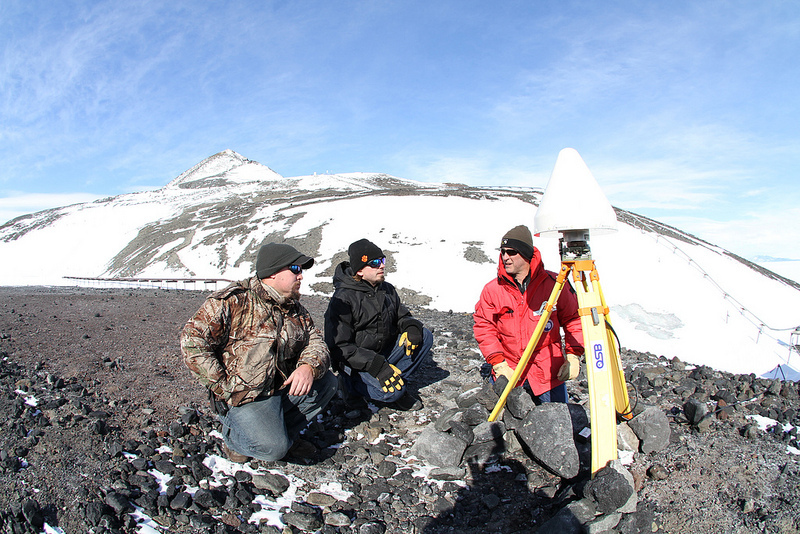 Ground-based GPS stations ensure instrument accuracy and archiving and processing data calls for all sorts of computer hardware. Also, the P-3 crew needs tools, supplies and spare parts to ensure the plane keeps running in top condition. Some of this gear gets shipped ahead, but a sizeable portion travels on the P-3 itself both into the field and from base to base. Loading and unloading all of this cargo (and the team’s luggage) is a big job, but the team has practiced the job many times, allowing them to finish quickly. To unload luggage the team formed a human chain, passing bags from the plane, down the stairs, and to the ground. Gear cases and spare parts took a little more care. For this, airport ground crew brought over a conveyor truck to bring cases down to people waiting on the ground. From there team members carried cargo over to different areas on the ramp depending on which instrument it supported. 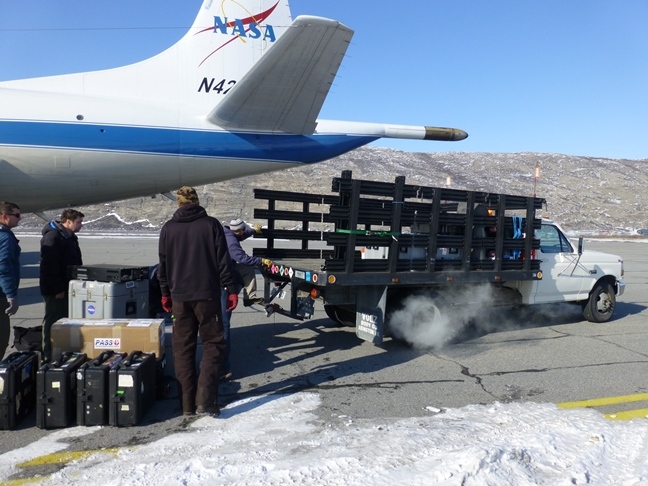 Aircraft parts and tools would stay at the airport, while luggage, instruments and computer gear would go to the Kangerlussuaq Science Support Center, where the IceBridge team will spend the next few weeks. 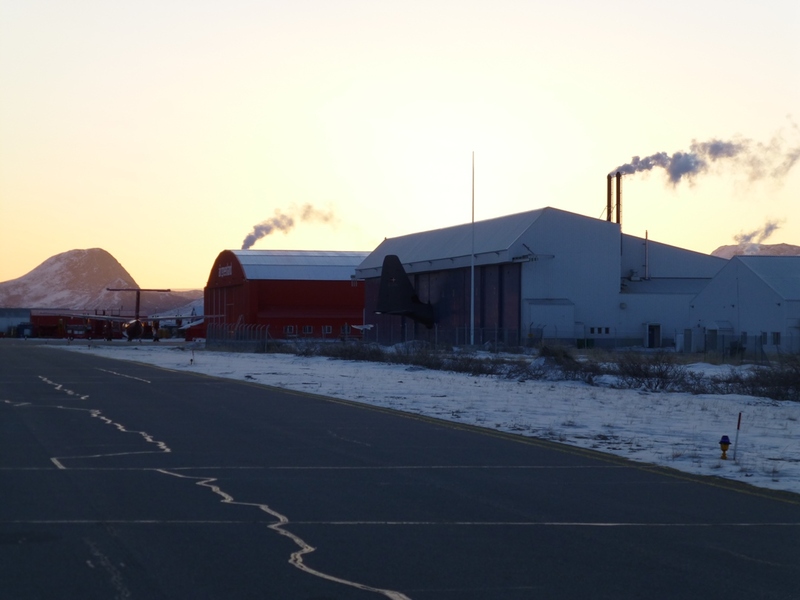 For people living and working at Thule Air Base, Greenland, weather is a near-constant concern. 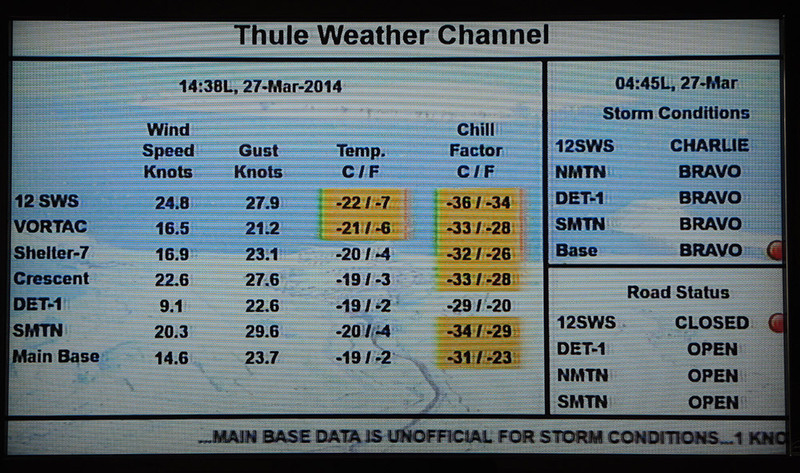 From mid-September to mid-May – the winter season – Thule can be subject to dangerous storms. A low pressure system off the coast can bring winds down off of the ice sheet, which pass through the valley Thule Air Base sits in. These high winds cause extreme cold and the reduced visibility caused by blowing snow can quickly make it easy to get lost even a few feet away from a building. Because of these dangers, Thule Air Base operates under a set of storm conditions that reflect temperature and visibility and restrict movement around the base accordingly. Storm Conditions Normal and Alpha – The first of these conditions are Normal and Alpha. Neither of these translates to immediate danger, though under Alpha conditions personnel should prepare for the weather to deteriorate quickly. Storm Condition Bravo – Pedestrians are required to travel in groups of two or more and stay on approved roads. Those traveling in vehicles should have a radio to communicate. Storm Condition Charlie – Non-essential buildings close and personnel are to return to quarters using either dedicated vehicles or one of the base shuttles or taxis. With IceBridge’s Arctic campaign flights about to begin, scientists, instrument operators and aircraft experts have been hard at work preparing the NASA P-3 airborne laboratory for its long trip north. On Mar. 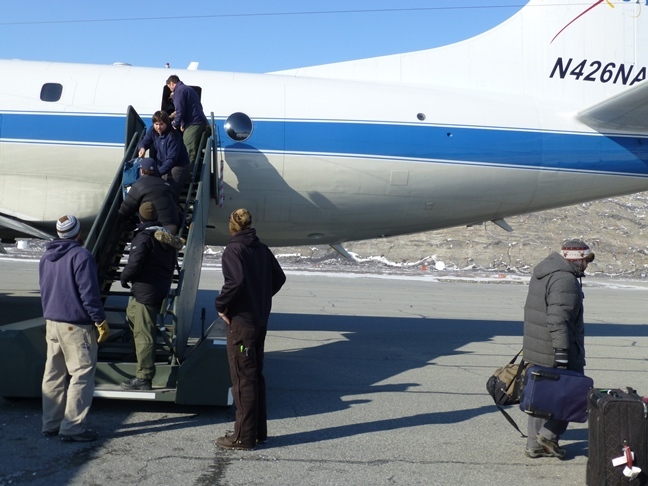 10, 2014, the P-3, carrying instruments and researchers, flew from NASA’s Wallops Flight Facility in Virginia to Thule Air Base in northern Greenland. NASA uses a fleet of research aircraft to study things like urban air quality, soil moisture and polar ice, meaning that these aircraft are in high demand. Planes go from one mission to the next with only a few weeks in between to remove the previous mission’s instruments, perform regular maintenance and install equipment for the plane’s next deployment. Removing the instruments gives aircraft technicians the room they need to work on the plane’s engines, electronics and other equipment. Once they are finished, teams install instruments and equipment racks containing the computers and electronics needed to control them. 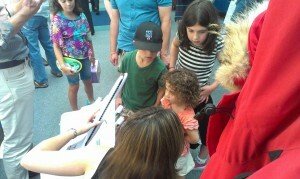 The moment of truth for this process is a successful test of aircraft and instruments. 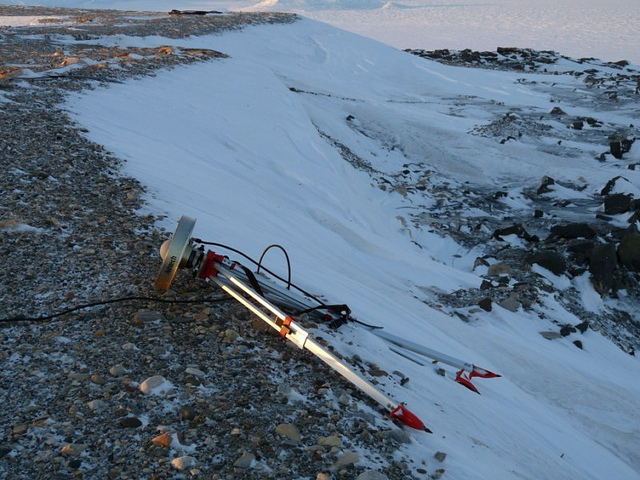 First, researchers check instruments and wiring on the ground. Once satisfied, the P-3 goes through a series of three check flights: an engineering check flight and two project check flights. The first of these three is the engineering check flight, which took placed the morning of Mar. 6. 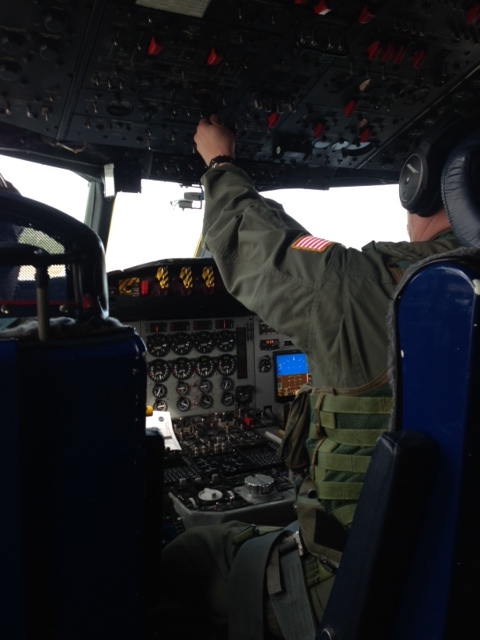 On this flight, P-3 pilots and crew put the aircraft through its paces to make sure things are in proper working order. Later in the day, the P-3 took off again for the first project check flight, and flew along beaches on the Atlantic coast to test the aircraft’s GPS gear and the Airborne Topographic Mapper instrument. The next afternoon the IceBridge team took off again for the second project check flight to test the various radar instruments aboard the P-3. To carry this out the team flew south from Wallops and turned out to sea around Virginia Beach, heading for open water. The relatively flat surface of the Atlantic Ocean acts almost as a mirror for the radars, providing a good test environment. Also, by flying far off the coast, the team can test radars without the risk of interfering with electronics on the ground. After completing these check flights, the team set out to pack their bags and rest before the flight to Greenland. Once leaving Wallops, the P-3 and the IceBridge team will spend the next 11 weeks in the Arctic, collecting valuable sea and land ice data before returning to the United States on May 23. As a Digital Mapping System (DMS) operator, I have a fairly consistent morning ritual to prepare for a day of flying over the ice. This consistency is necessary for both operational integrity and presence of mind while we are attempting to accomplish our mission. I am often apprehensive at the beginning of a daily mission because I know it is so easy to overlook a small detail that might have a large effect later. All the average person looking down into the P-3 bomb bay would really see is a pair of Canon DSLR cameras pointing down at the ground, unaware of the great care that goes into the preparation. Once at the plane, I clean our optical window inside and out with pure ethanol so that there is no residue of dust or grease left behind (a task often made difficult by gusting winds, freezing temperatures and other unforeseen environmental effects). I then clean the cameras and lenses and take a few test frames on the ground to ensure that the cameras are working properly. After that, I set up our GPS receivers to make sure we can capture the position and orientation of the P-3 at many fractions of a second. Next, I set the camera’s frame rate so we are sure to capture at least 60 to 70 percent overlap from one frame to the next. This changes due to how high or fast we are flying at any given time, I am constantly adjusting and fixing settings during flights, calculating frame rates by hand. Very little of the DMS system is automated for the simple fact that the human eye is often the best tool to determine the correct settings and factors that make for good data collection. I have to use whatever limited time I have at my disposal to get the best results I can, writing down by hand all changes made, as well as environmental conditions outside the plane that might adversely affect our imagery such as clouds, haze, fog or poor sun angle). Because the instrument I operate is, in essence, a pair of very specialized digital cameras, I feel that it often gets overlooked by visitors to our little world within the tin belly of the NASA P-3. I don’t mind, really, as I completely understand the draw that one might have towards the exciting technologies involved in the laser system, the radar arrays, the gravimeter sitting shrouded in the mid-body of the plane, or the magnetometer poised in the P-3’s stinger. But what most people don’t understand is that other than the pilots, I have probably the best view of the world outside the plane while we fly. Through hundreds of thousands of digital photographs I document the world as it passes below us at 250 miles per hour and see it clearly and unobstructed. Also, I get a view that none of the other instruments get, because as a human being, you can see our data and have and instant and intuitive understanding of what you are looking at, without any need for computers to help you interpret what you are seeing with graphs or charts. They say a picture is worth 1,000 words. What does 15,000 pictures over an 8 hour flight say? As I watch glaciers, mountains, valleys, rivers and ice pass below us in crystal clarity, I am consistently awe-struck by the images that I see. Few people have ever gotten such a pure perspective. Some of the places we go have never been seen by human eyes, and I am both humbled and honored every time we fly by the task and mission we have set before ourselves. It is a fairly daunting mission, with radical scope, and I am proud to be a member of the team responsible for helping to make it happen. Like I said before, the casual observer may think of operating DMS as mundane, but I know for a fact that they don’t see what I see. For just a brief moment, I find myself finally able to pause and reflect on just how far we, Operation IceBridge, have come as a team and a project. 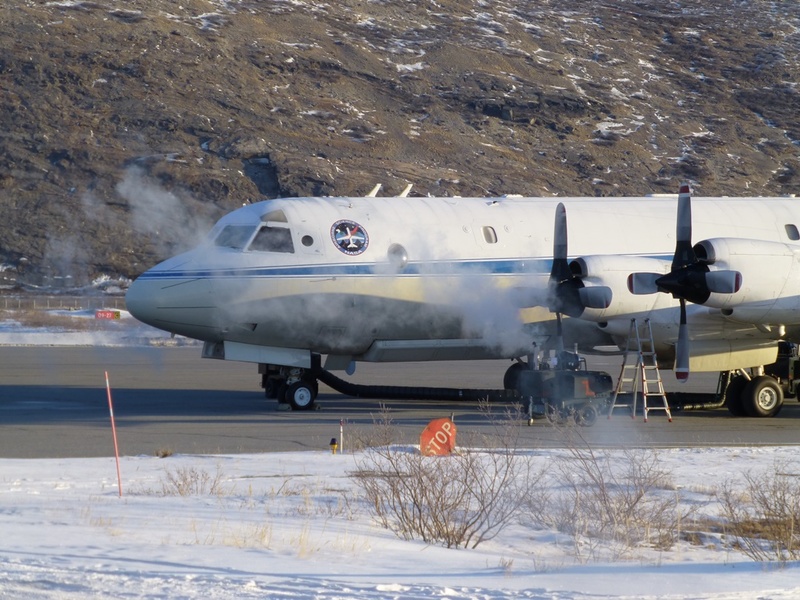 It was roughly one-and-a-half years ago when we were first tasked by NASA Headquarters to bring the P-3, a four-engine turboprop aircraft, to McMurdo Station for new Antarctic operations. At that time, I didn’t even remotely comprehend the task that lay ahead for me. It would take an infinite supply of persistence and tenacity, as it would be, to overcome new challenges, hurdles, processes, logistics, requirements and doubt, with a government shut-down thrown in the mix. As I write these words, I am sitting in the Crary Science Building, at McMurdo Station, on Ross Island, glancing out of the third floor panoramic window. Many of my team members sit across from me as we wait in anticipation for a storm to blow in. McMurdo Sound, Mt. Discovery, the Royal Society Range and Black Island look back at me, reminding me that I am in Antarctica with my entire team of 31 people. In just three weeks, our entire team has arrived safely, taken multiple training classes, established and constructed four GPS ground stations and unpacked several thousand pounds of cargo. 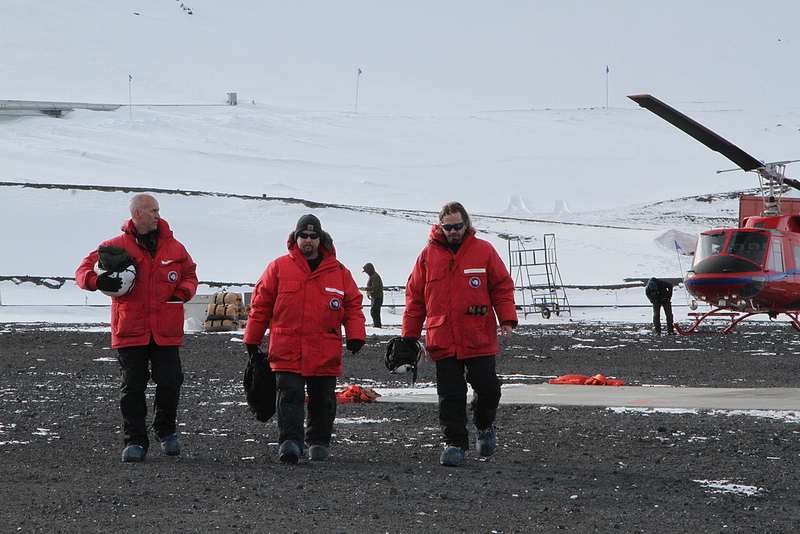 We’ve also conducted two GPS ground truth surveys (one via helicopter operations to the infamously harsh and windy Black Island), landed the NASA P-3 in Antarctica for the very first time, performed a safe and successful check flight and completed five full science missions. 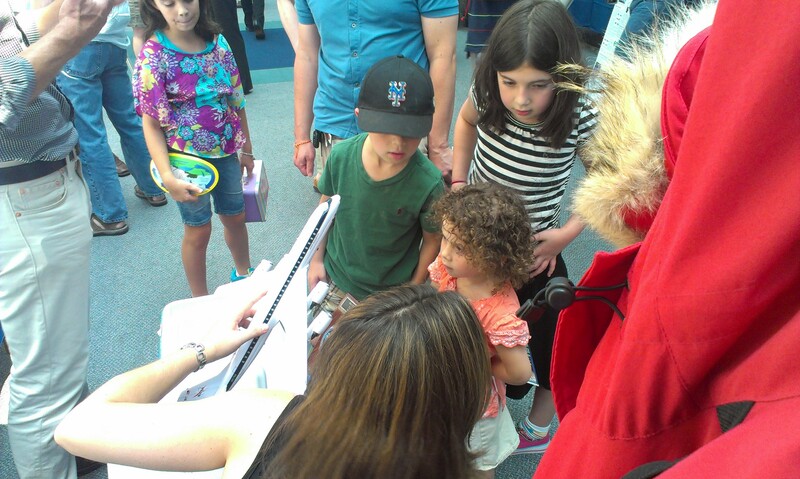 Our U.S. Antarctic Program contacts have told us that we’ve accomplished more in these three weeks than many science projects do over a whole multi-month season in McMurdo. I am so proud to be a part of this amazing team, and watch in awe how each of our instrument teams and flight crew stop at nothing to excel at what they do, and to project professionalism and respect for others around them. I work with a team of super stars. I love it when a plan comes together. But how does one get a team of 31 people to the ice, land a NASA scientific airplane in Antarctica for the very first time, and conduct daily scientific airborne surveys based from a runway made of sea ice? 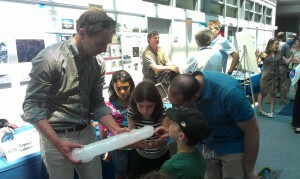 Yes, I said sea ice. How does one meet the needs of both the IceBridge instrument teams and aircraft office, while also establishing credibility, trust and respect with the National Science Foundation (NSF), the federal agency responsible for managing and leading the U.S. Antarctic Program (USAP)? And let’s talk about cargo. How do you get 35,000 pounds of cargo to the most remote and harsh continent on the planet? Not quickly. How do you take care of a complex aircraft on an airfield made of ice in extremely cold temperatures without a hangar while following strict environmental protection regulations and the rules of the airfield outlined by the airfield manager? What order do you do all of this in, when does the planning start and what are the milestones and decision points? How do you go from initial concept to actual flight operations in Antarctica? 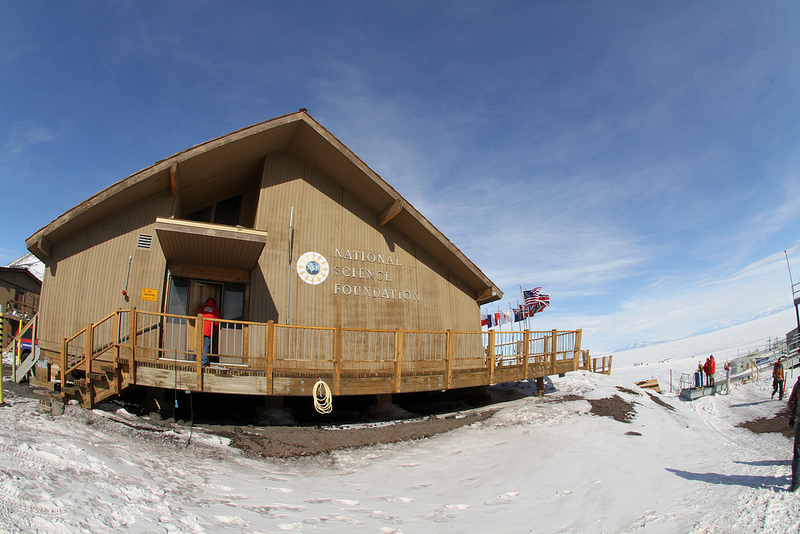 A year-and-a-half ago, we met with NSF’s Office of Polar Programs to first discuss our interest in deploying to McMurdo in 2013’s austral summer season. 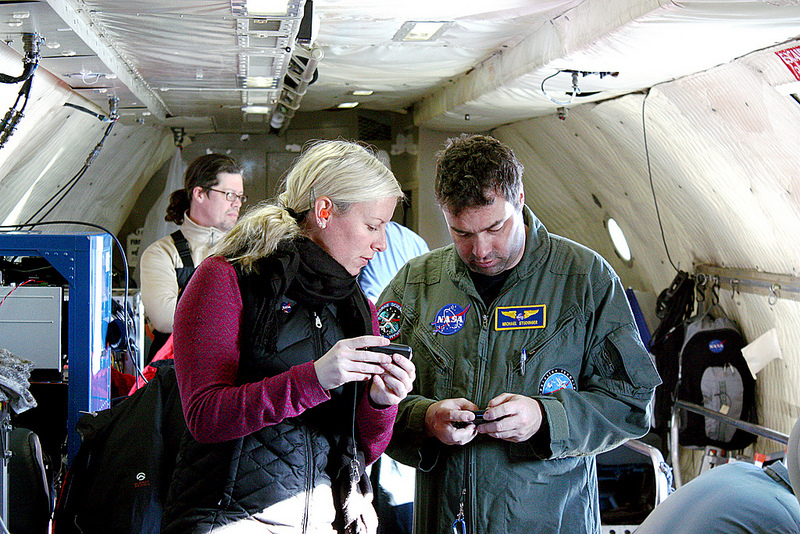 We described our scientific and mission objectives, which included bringing our own aircraft to the ice with us. To request approval to bring a large team of people and a large aircraft to the ice demands building credibility with multiple organizations, showing strong scientific value, financial responsibility, safety, realistic success criteria, and an understanding of resource limitations and management. Bringing one’s own aircraft to the ice, especially without skis, demands a thorough understanding of risk and risk mitigation, and strict adherence to the unique operations protocols of operating an aircraft on the ice. 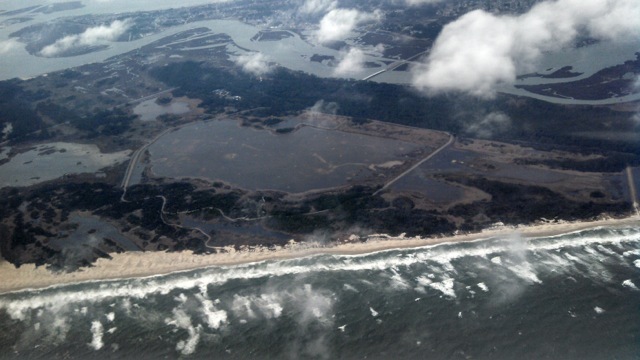 The unique environment and quickly-changing weather required us to establish a relationship with SPAWAR (Navy weather experts) and the 109th Airlift Wing of the Air National Guard who helped us understand the weather, manage communications protocols and build our flight operations safety criteria. 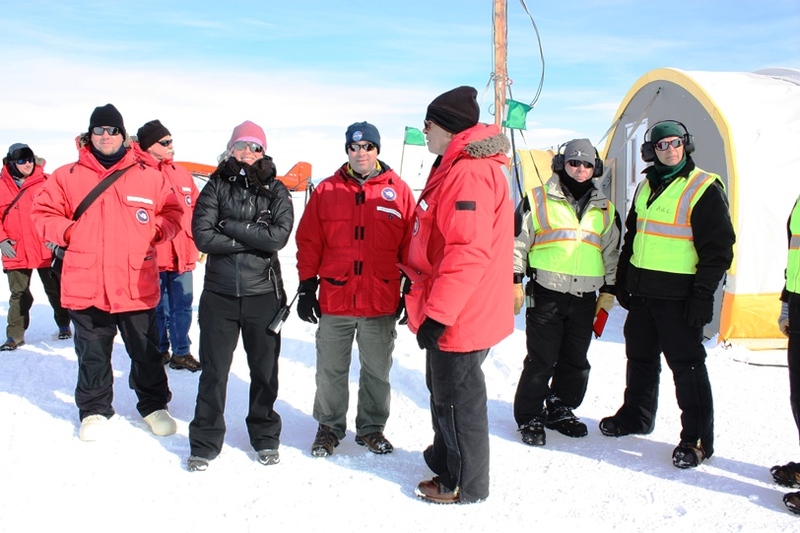 Once the big picture plan, milestones and risk mitigation strategies were established with NSF, we were introduced to their logistics and operations team, the Antarctic Support Contract (ASC). 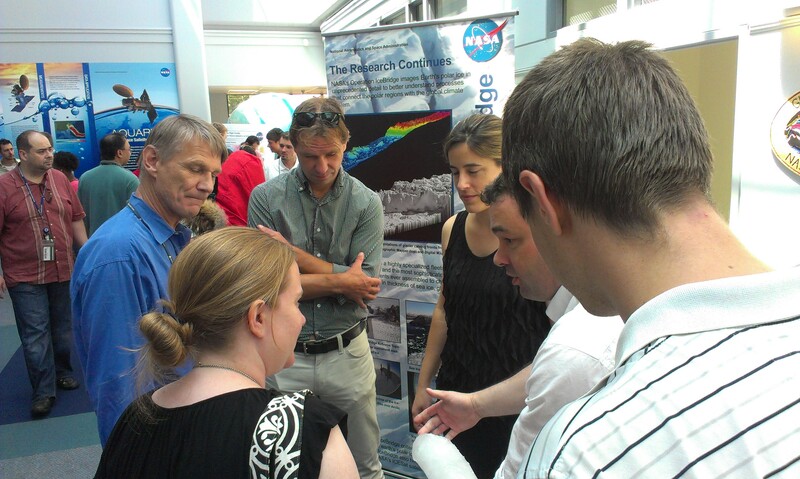 Approximately one year out from our current deployment, we began planning the details that would help better define our IceBridge team footprint on the ice, and the resources we would need from ASC and NSF to ensure our science teams and flight crew could be supported. 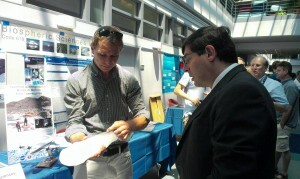 It took many phone calls, teleconferences, and emails to make all of this happen. In fact, so much time was spent with my ASC planning team, I felt as though we were all old good friends from years past. We worked out details ranging from deploying personnel to the ice and ensuring all of their needs were met, to routing our 35,000 lbs of cargo halfway around the world via ship and plane and expecting everything to arrive in McMurdo, intact, a few days before we did. Even more complex was establishing an operations plan that would support our NASA P-3 and its flight crew on the ice, allowing them to service and maintain the aircraft in harsh conditions. To give an idea of how to make this work, the air crew’s day began at 4 a.m. to support a 9 a.m. takeoff – reflecting the time needed to get to the runway, set up the aircraft ground support equipment used to warm the plane slowly, preserving the condition of the runway and allow time for the instrument operators to power up their equipment. These five hours were followed by an eight hour science flight, which was followed by a two hour post flight routine. And this would start all over again the next day. To build confidence in this plan prior to our team arrival this season, three of us conducted a site survey last year to research and understand the operational environment of an airfield built on sea ice. We established a solid relationship with the airfield manager and were able to build and plan based on input he had given us. Seeing this plan come to fruition has been one of the most rewarding aspects of my career. Our instrument teams have years of experience operating in polar environments, and they met new challenges, which made for extremely long days, and new hurdles to overcome, which they did with grace. When our P-3 aircraft landed on McMurdo’s sea ice runway on Nov. 16 , all of us who had deployed up to a week earlier watched in awe, full of emotion, as this historic moment was captured in time. The P-3 on final approach is a beautiful sight to watch, and I can’t remember ever having felt as honored and proud as I did greeting this crew who flew her and took care of her on her long journey across the globe, and onto NZIR, the sea ice runway, Ross Island, Antarctica. 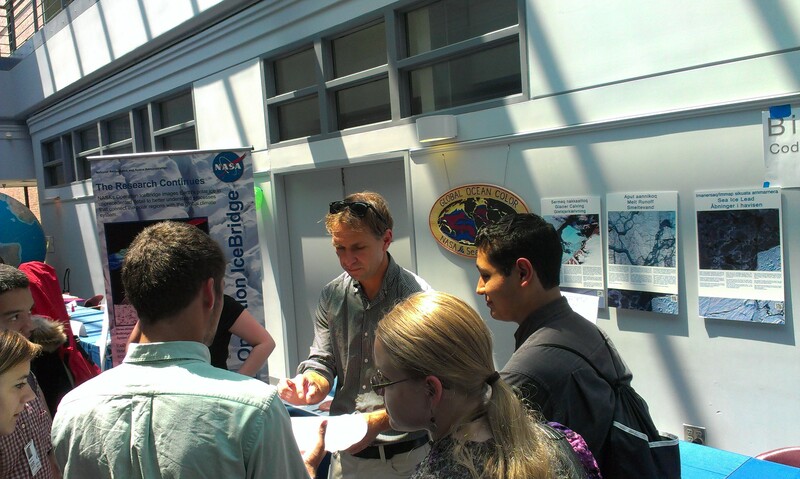 One of the keys to IceBridge’s success is effective communication between every member of the team. But keeping in touch in the remote locales IceBridge operates from can sometimes be tricky. On plane there’s the intercom system routing through headsets and the radios and Iridium satellite communication devices aboard the P-3 allow the plane to communicate with someone on the ground virtually anywhere in the world. But what about when the team is on the ground? When everyone is in the office or their rooms then email works. When away from the office, however, things get more complicated. Some areas have mobile phone coverage and it’s easy to take such a thing for granted these days. But in Antarctica, a locale where keeping in touch can literally be a matter of life or death, cell phone service is nonexistent. 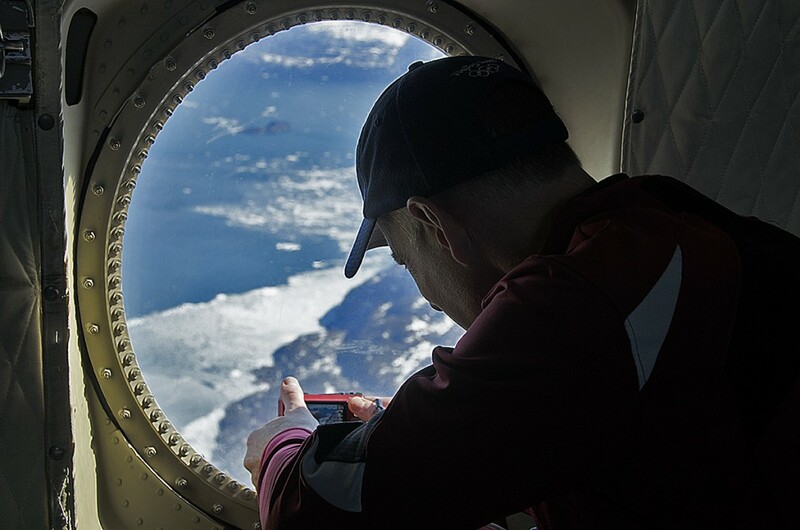 Even in a developed station like McMurdo the smartest of phones becomes nothing more than a pocket-sized music player, camera and entertainment device. To meet the communications needs of people living and working in this often harsh environment, three tools some people might consider virtually obsolete: the landline telephone, the two-way radio and the pager. In the U.S., many homes are ditching their landlines. But in Antarctica they’ve never gone out of style. The backbone of the system is different, as calls are routed through the internet through the U.S. Antarctic Program’s office in Denver, but from the user’s perspective things are just as they were years ago. Dorm rooms, offices and common areas all have telephones that can be used to call others on the station. 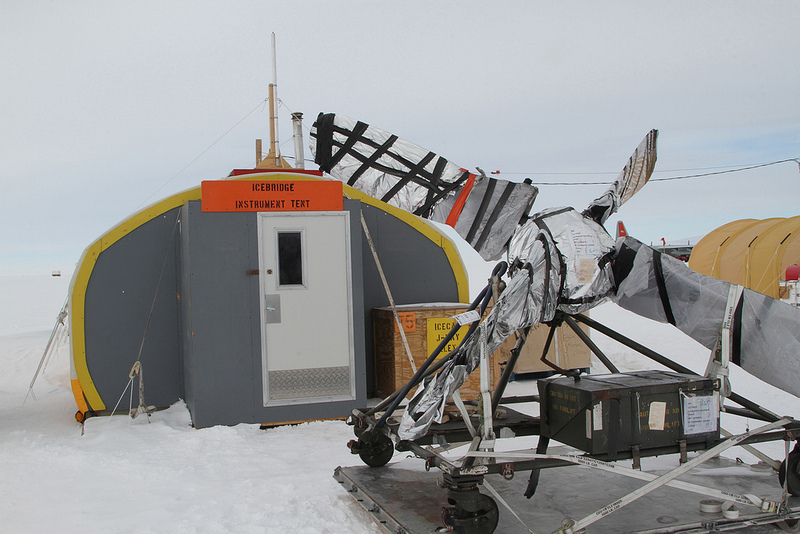 IceBridge’s two main work areas, McMurdo’s Crary Lab and the team’s tents at the sea ice airfield, have telephones set up, allowing team members in these two locations to stay in touch. If you know someone is in their room or at the office, calling them on a landline phone is by far the quickest and most reliable way to contact them. However, it isn’t uncommon for team members to be out tending to instrument ground stations, unloading cargo or visiting the weather office for the latest forecast. In these cases, team members rely on a seemingly obsolete technology, the pager. Before the widespread adoption of cell phones, personal pagers were fairly common. You’d call someone’s pager and enter your phone number and their device would beep, showing that you wanted to talk to someone. That person would then need to find a phone and give you a call. As inconvenient as this sounds the infrastructure for a paging system is more robust and less complicated than that needed for cell service. The pagers at McMurdo Station are a little more advanced though, allowing for text pages and updates. By sending an email to a special address you can send a short message to someone’s pager and station management use the pager network to send out updates on weather conditions, something of vital importance in an environment like Antarctica. Pagers and telephones work out great in town or between town and the airfield because nobody is terribly far from a phone at any time. But for people working outside of town, such as the people setting up instrument ground stations or the team who did the GPS survey of Black Island more than 20 miles away, an extra step is called for. This is where the two-way radio comes into play. 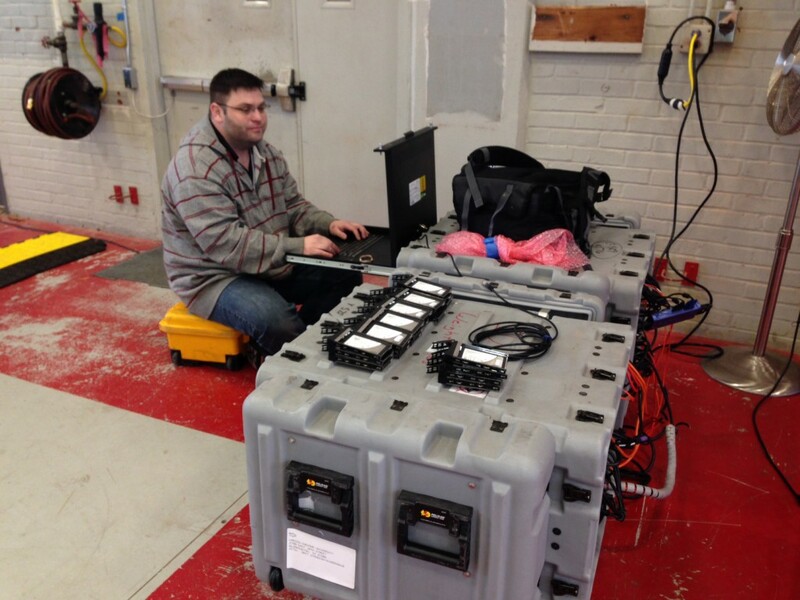 The VHF two-way radios used at McMurdo are a great way for widespread teams to keep in touch. Each radio can tune into one of a handful of channels dedicated for different purposes. 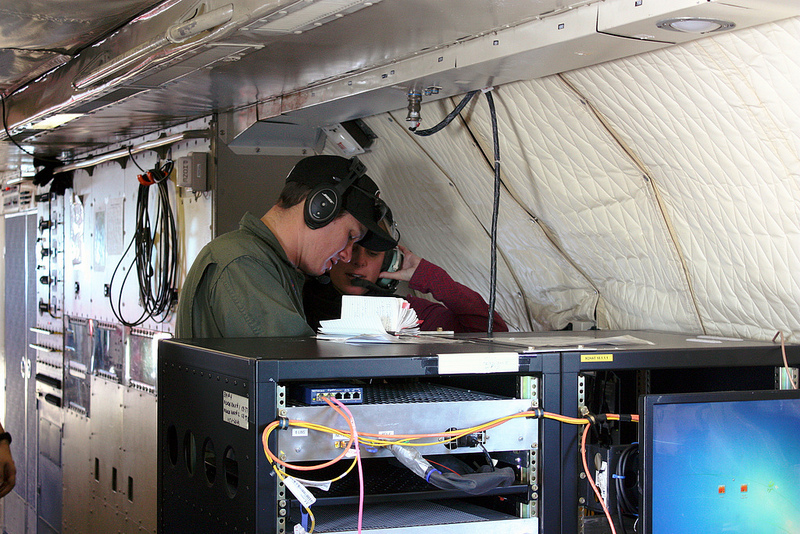 IceBridge personnel communicate on the science channel, while shuttle drivers and airfield personnel would use different channels. Although not as convenient as the average smart phone, the combination of land line telephones, pagers and two-way radios provides a way for people living and working in Antarctica to stay in touch with one another. Before the first survey flight of an IceBridge field campaign can get under way a lot of things have to happen. Instruments have to be installed on the plane, researchers need to get into the field and ground stations need to be set up. 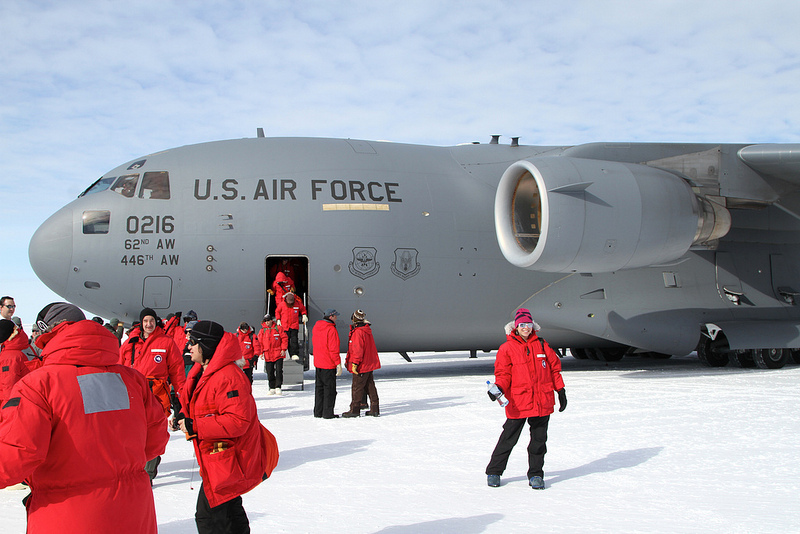 IceBridge’s McMurdo-based Antarctic campaign is the result of a year and a half of planning and preparation, all of which came together during a highly choreographed logistical dance that spanned more than a week and half of the globe. 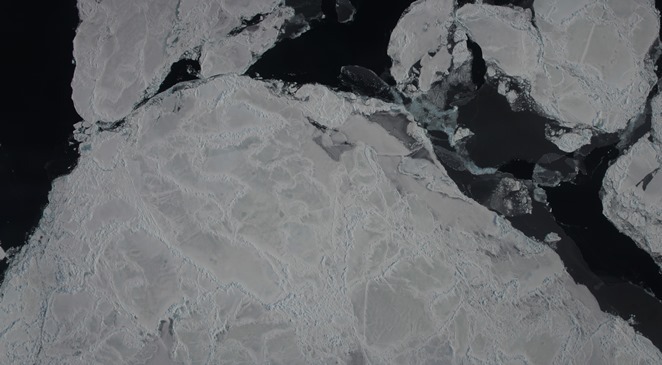 After a nearly four-week-long delay of a few weeks caused by the U.S. government shutdown, IceBridge went into high gear to finish up preparations for a shortened campaign. Before anybody could start on their way to Antarctica the mission’s scientific instruments needed to be installed on the P-3. Over a period of about two weeks, aircraft technicians and instrument team members at NASA’s Wallops Flight Facility in Virginia installed IceBridge’s scientific gear. 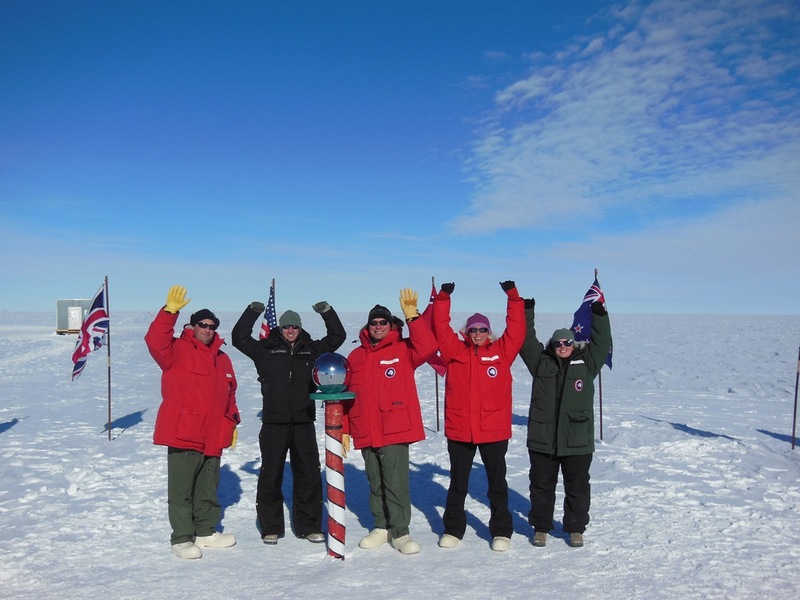 While this part of the team was finishing up their work at Wallops, a different group started their journey to the ice, flying to Christchurch, New Zealand, to receive their cold weather gear. While the rest of the IceBridge team was finishing up their work on the P-3 and traveling to the ice, this small group was busy laying the groundwork for the campaign by unpacking shipments, setting up GPS ground stations and preparing for a GPS ground survey of a nearby island. With instruments installed and ground tests complete, most of the rest of the team packed up for the long flight south. Remaining behind were a handful of instrument specialists and pilots and crew for the P-3. 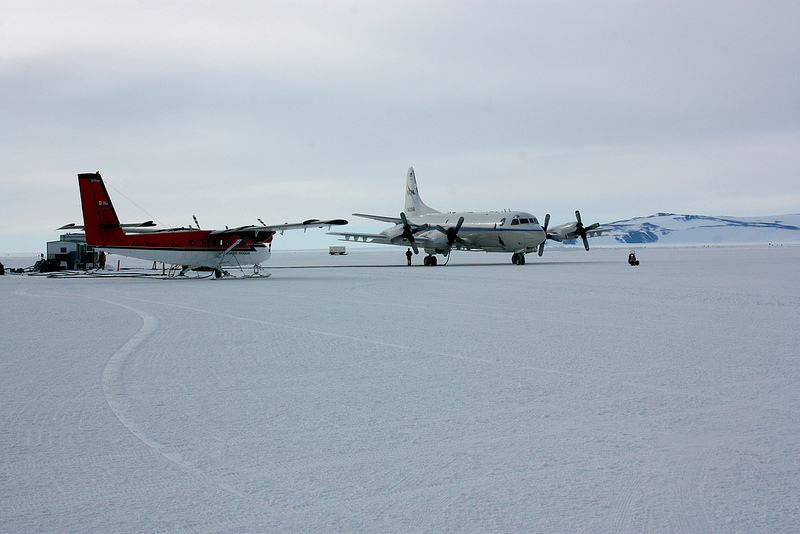 Scientists and instrument operators would travel to Antarctica while the P-3 and its onboard instruments underwent a series of check flights. With these final checks of the aircraft and instruments complete, the remaining few instrument specialists who remained behind followed the first and second waves of IceBridge personnel on commercial flights to New Zealand. 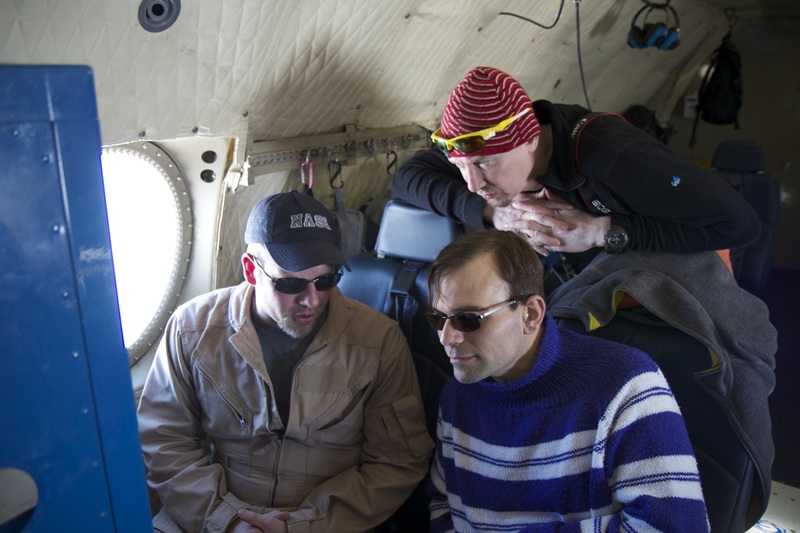 This differs from the mission’s previous campaigns because normally scientists and instrument operators fly on the NASA research aircraft to the field location. The reason for the difference this time is that the transit from NASA Wallops to McMurdo Station in Antarctica would take several days. Going to Thule, Greenland, on the P-3 takes less than eight hours and traveling to Punta Arenas, Chile, on the DC-8 takes a 12 hour flight to Santiago followed by a shorter hop to Punta Arenas the next day. But this time, the P-3 would have to make stops in California, Hawaii and American Samoa, flying eight hours each day, before making it to the last stop before the ice in Christchurch. The P-3’s arrival on Nov. 16 marked the completion of a long and complicated process and the beginning of a new and historic field campaign. 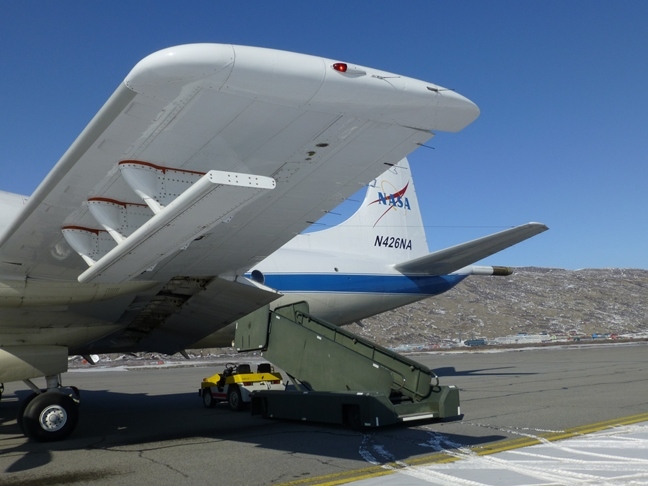 For the first time ever a large, wheeled NASA aircraft would operate directly from Antarctica. On Tuesday Aug. 13, at 1 p.m. EDT, high school science teacher Mark Buesing will host a live online event to share his experiences with Operation IceBridge during this year’s Arctic campaign. 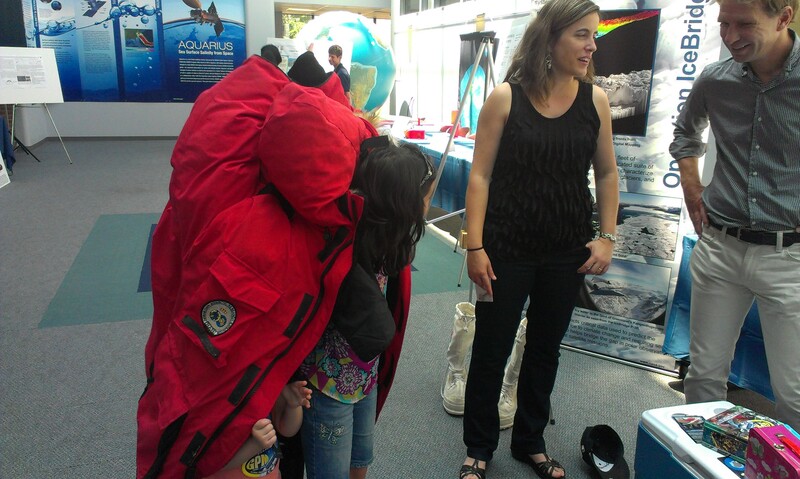 This event, known as Polar Connect, is hosted by PolarTREC, an organization that pairs science teachers with scientific expeditions to the Arctic and Antarctic as a way of bringing up-to-date research into the classroom and inspiring students to become the next generation of scientists. 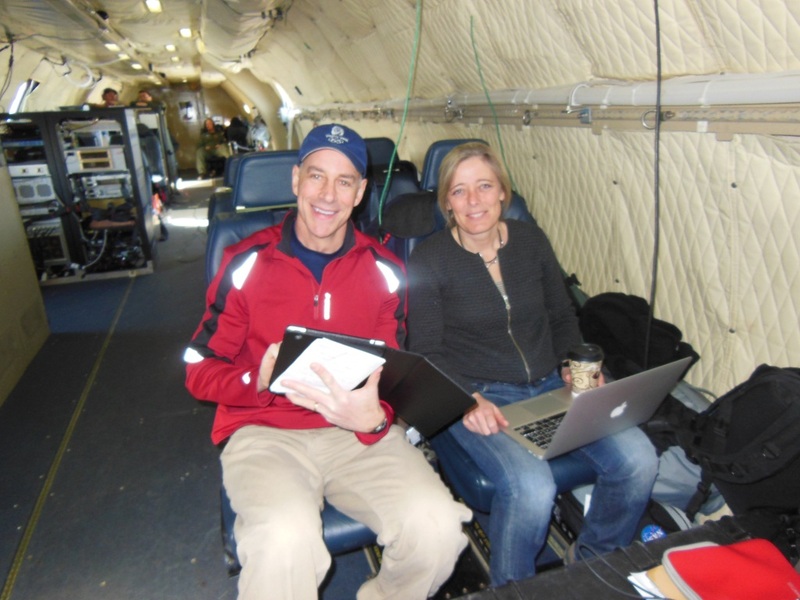 During this hour-long event, Buesing and people from the IceBridge team will talk about their time flying over Greenland’s ice sheet, glaciers and sea ice and answering questions from the online audience. To learn more about this free event and to register, visit the PolarTREC website at http://www.polartrec.com/polar-connect/register.